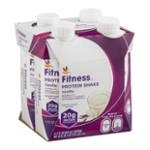 Filtered Water, Milk Protein Concentrate, Maltodextrin, Less Than 2% Of: Vegetable Oil (sunflower, Safflower And/or Canola), Calcium Caseinate, Medium Chain Triglycerides, Whey Protein Concentrate, Lactase, Natural And Artificial Flavors, Cellulose Gel, Cellulose Gum, Salt, Sucralose, Datem, Acesulfame Potassium, Carrageenan. Vitamin And Mineral Blend: Potassium Citrate, Magnesium Phosphate, Sodium Phosphate, Potassium Phosphate, Sodium Ascorbate, Ferric Orthophosphate, Zinc Amino Acid, Tocopheryl Acetate, Biotin, Vitamin A Palmitate, Niacinamide, Phytomenadione, Potassium Iodide, D-calcium Pantothenate, Chromium Chloride, Copper Amino Acid, Cyanocobalamin, Sodium Molybdate, Sodium Selenite, Folic Acid, Cholecalciferol, Pyridoxine Hydrochloride, Riboflavin, Thiamin, Manganese Sulfate. Amount Per Serving: Folate-%dv-20%, Selenium-%dv-20%, Pantothenic Acid-%dv-20%, Biotin-%dv-20%, Manganese-%dv-20%, Vitamin K-%dv-20%, Chromium-%dv-20%, Molybdenum-%dv-20%.